Attending a meeting in the unfinished Meditation Hall: Marty Behrens, Jennifer Overbury, Jan Beange, Brooke Griffin, and NorCal Director, Cody McGough. The open door provides a peek into the atrium room. 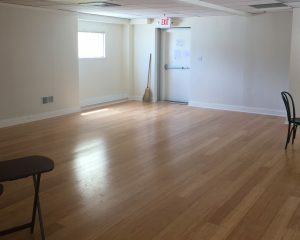 The renovation of our new space upstairs is coming along beautifully, and we need your help to cover the final cost of materials. Look at those Beautiful floors! Moving on Up—The walls and doors are built and installed, the floor has been laid, and we are close to completing the baseboards, painting, ceiling tiles and lights. Lyle Larson is building an impressive housing, based on a Japanese tokonoma design. It will be home to Sakyong Mipham Rinpoche’s NOW calligraphy, and Alice’s ikebana art installations in the atrium room. Many thanks to the incredible hard work and leadership of Kevin Walsh. He spent several weeks carefully installing the new wood floor and baseboards. Additionally, Kevin mentored Directors Cody McGough, Alex Van Gils, and noble members like Eric Wise and Mark Jegi in laying the under layer and bamboo floor. Now we need to raise an additional $4000 to cover the costs of the remaining materials, so we can finish the project by Harvest of Peace. Northern California Shambhala is contributing $4000, to help us meet our total goal of $8,000. We negotiated with the landlords so that they are covering the bulk of the renovations. This included tearing down old walls, and building new ones. Please contribute so we can be fully funded, and have completed renovations by Harvest of Peace on September 25th. Please consider making a donation of whatever amount you can. 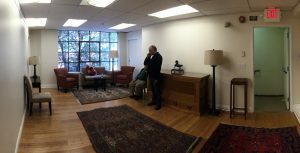 We would love for you to join us for the opening of our beautiful new space on Harvest of Peace, and please feel free to stop by to experience our progress. We love the encouragement. This is a heartfelt request that you consider offering any amount of money you can toward the new renovation of the San Francisco Dzong. The estimated cost was $6000, and as you know the community is already stretched—renovation costs always extend beyond what is expected. Director Alex Van Gils, Mr. Kevin Welsh and team, have gone above and beyond in keeping the Dzong doors open! Although I’m grieving our loss, I found I was pleasantly surprised at what they are up to upstairs. They’re making what could be considered a bad situation of downsizing into an elegant endeavor. The new upstairs space is going to be tree top, light and cheerful. They are working 24/7 on our behalf, and I would like to ask you to support them in any way you can! Please take a look at the progress next time you are at the Dzong. If you are able to contribute, please do. The Atrium Room, where the old Werma Shrine Room used to be. The new Meditation Hall will be beyond the wall on the left. In this photo, Sean Scullion and Bruce Dal Santo contemplate a chair.